45 rooms in a quiet location. cable TV and room safe. 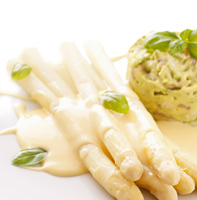 The new asparagus season is underway. Choose your preferred combination from our menu. The Hotel - Restaurant “Rheinterrasse Benrath” has been in family ownership since 1967. It is located to the south of Düsseldorf between Benrath and Urdenbach, right next to the Rhine with its beautiful wetland landscape. Adjoining the hotel is Benrath Palace, famous well beyond the boundaries of Düsseldorf for its attractive parkland. We are delighted to welcome you to our hotel. Dirk Wegner and Gabriele Schönenborn.